WHY WE CO-SIGN: With all the rappers that hail from Atlanta, you would think by now—through their name dropping—you would know a couple of cool stores to check out if you ever found yourself in the A. But no. 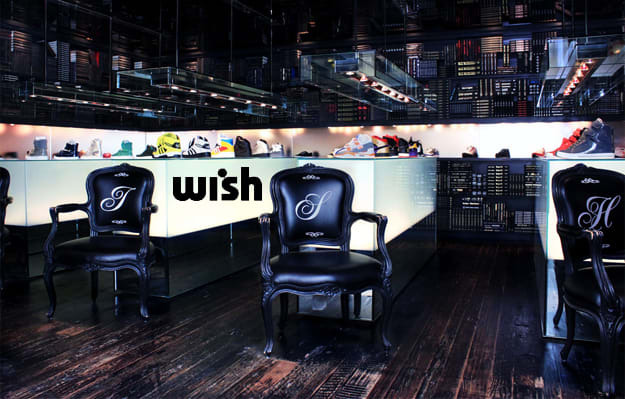 However, there is one shop that deserves a little limelight: Wish. Located in Atlanta&apos;s Little Five Points area—which is a little like the Greenwich Village of ATL—Wish offers all the trappings of a streetwear boutique you&apos;d find in LA or NY. Surrounded by indie record stores, pharmacies and other quirky shops, Wish&apos;s cutting edge design is almost alien. Its cues are taken from the boutiques past life as a library: the sneaker section (located in the basement) features rows of bookshelf-like sneaker displays and library themed wallpaper. While upstairs, the shop incorporates see-through floor panels, as well as the industrial clothing racks with steel clips as hangers. But a shop is only as good as its products, so what about their wares? Name a brand and you&apos;ll find it here. Everything from Nike QS, Play by Comme Des Garcons, and Nudie. Mix that with the staff&apos;s southern hospitality and you have a store that T.I. and Jeezy should get real familiar with. But even if they don&apos;t, you should. Complex: What aesthetic are you driving for you in your store? Franklin Cooke: Wish is located in a historical building in an edgy neighborhood of Atlanta, Little Five Points. The building was at one time a Carnegie Library. Wish underwent a complete renovation in 2006. Our goal was to maintain the eclectic flavor of the community that we are located in as well as the integrity of the buildings history as a library. Complex: Are there any collaborations in the works? Franklin: A Wish x Coal Headwear Beanie as well as a Vans x Atlanta Braves x Wish collaboration. Franklin: A Mishka x Phenomenon Leather Coat, it has really nice button detail and quality leather. Complex: Who are your style icons? Franklin: Sid Mashburn, Ralph Lauren, and Andre 3000. Franklin: A Heather Hooded Sweatshirt by Yoko Devereaux.